our perfectly imperfect life: Plagued by strep. I have quickly come to realize how pesky strep can be. It has plagued our family over the past month ... it is time for it to move on. Swiftly. December 8 ... Mason diagnosed with strep. December 8 ... Addison diagnosed with strep. Vomiting all night. December 10 ... Payton diagnosed with strep. 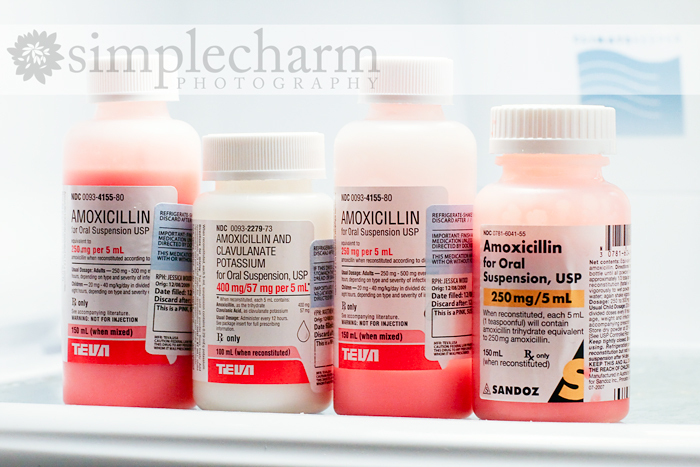 Three kids with strep leads to a fridge full of antibiotics. On Christmas Eve, Payton started vomiting and spiked a fever. No signs of a sore throat, but later in the week Addison started showing signs. So off to the doctor we went. December 28 ... Addison diagnosed with strep. December 28 ... Payton diagnosed with strep. Mason was also tested on December 28, but his quick test was negative. We decided to treat him anyway, at least until we got the official results back. Those ended up being negative, so we stopped his antibiotic. On December 29, Kyle and I both went to be tested, since we both had sore throats and headaches. It was late in the day, so we had to wait for our official results to come back. On January 2, the results showed that Kyle was positive for strep. My test had not come back yet, but they decided to just treat both of us with antibiotics. So once again our house is full of antibiotics ... of a little different variety. The girls will return to the doctor once they complete their antibiotics for another strep test. We want to make sure it is completely gone this time. It has really affected Addison the worst ... poor thing. it will be a great feeling to get that med. out of your house. I hope everyone is well soon. How do you make bottles of meds. look good (lol)?? I think part of the problem is the Amox, it's useless in our family, hopefully you've got stronger stuff now. Throw out your toothbrushes too, strep loves to linger there! Strep was negative on Braska, but she had her first ear infection diagnosed a couple weeks ago. Started on amox but it didn't kick it. KiKi ended up with an ear infection a week later and we put them both on Augmentin. They're still not beating it, so I'm not sure what's up. I feel your antibiotic-filled fridge pain. Bummer. Hope you get well soon. And make sure to increase the probiotics to make up for those nasty antibiotics. I hear ya! Carly has been battling strep since Dec 17. We did a 10 day course of antibiotics with Omnicef. Thought she was better. Not! Dec 29, back to the doc. C was complaining of a sore throat and sore tongue. Refused to eat or drink one thing that whole day. Back on antibiotics. This time a 5 day course of Zithromax. Jan 4. Back to the doctor again. Spots in the throat and complaining again of a sore throat. Back to antibiotic #1 for another 10 day course. Thankfully, she only vomited 1 time. And, has only ran a low grade temp. Oh, and did I mention that she now has thrush from all the stinking antibiotics??? I'm SICK of STREP throat! Hope you guys are all feeling better very soon. I can't imagine having 3 sick kiddo's at the same time. Plus feeling crappy and having a sick hubby. Man, I feel for you! We all had strep in Dec, too, and my poor Aidan vomits profusely with strep. Yuck! I hate it. I hope you're all well soon. How awful! I hope you and your family are feeling better soon. I've had strep before and it is horrible! Best wishes on a speedy recovery for all of you! I HATE strep! Feel better soon!